Retreats in darkness have been used by all the great spiritual traditions for thousands of years as a method for tapping deep clarity, accessing sacred wisdom, connecting with the Divine, and training to transform the mind/body system into a manifestation of wisdom. In dark retreat, the practitioner lives in complete darkness--eating, sleeping, meditating, and simply existing in a world without external light. 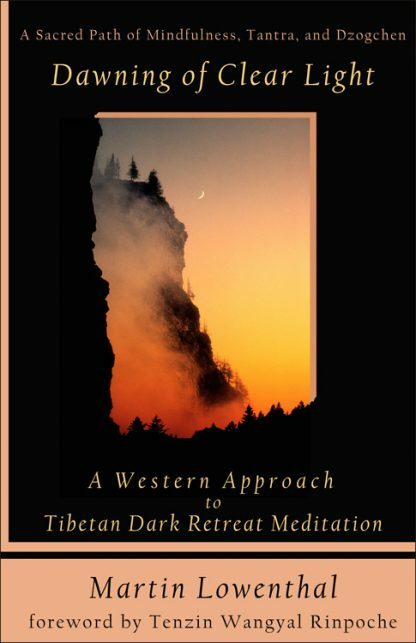 Traditionally, in Tibet, dark retreats were performed by monks as part of their training with the support of their monastery and their fellow monks. But dark retreats are of value to people from all walks of life, from the monastic to the busy householder--those with jobs, families, and all-too-many responsibilities. Martin Lowenthal has taken a practice little-known in the West and made it accessible by incorporating methods based in western psychology with traditional Tibetan Buddhism. There are many advantages of a retreat in the dark, one of which is rest for our eyes, weary from overstimulation in our visually oriented world, that then promotes overall relaxation of body and mind. This relaxation helps us cut through old mental and emotional habits, harmonizes the elements in the body, works with visions, and rests in the "Natural State." Retreats in the dark also improve the quality of our daily life. We can develop greater clarity and awareness in every aspect of living. When we improve the conditions of our lives, we provide an atmosphere more conducive to continued meditation practices. Dark retreat is also a powerful setting for practicing tantra. Tantra uses imagination, senses, and creativity to transform experience into food for the spirit. Dawning of Clear Light is a celebration, a joyous invitation to find the treasures that are hidden within your world and the world around you. Chapter 1: What is a Dark Retreat?